This tutorial is an introduction to Adobe Air application development using Flash CS3 (or later versions) for them who are unknown to Air applications or just beginners. In this post I want to explain how to develop a business card (desktop application) using some basic tools available in Adobe Flash. 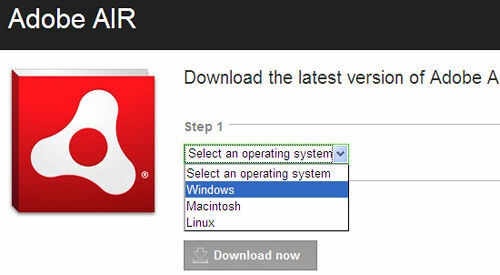 Download latest version of Adobe Air by choosing your Operating system. Now the environment is ready to develop an air application we need to just move forward to designing phase. Open flash cs3 or cs4 and select adobe air application at the welcome screen. Now a blank document is created with the default dimensions. So we need to change the width and height to 450px and 350px respectively. To change doc dimensions in the properties panel (Ctrl + F3), click on edit and give width and height. Like wise the by keeping the first key frame in contents layer selected add three more text fields (like twitter, facebook, www.9lessons.info ). Then the next step is to convert all the text labels into buttons. For twitter button give instant name as twitter_btn. For facebook button give instant name as facebook_btn. For lessons button give instant name as lessons_btn. Up to this step we completed the designing part of our tutorial and now we need to code our design. 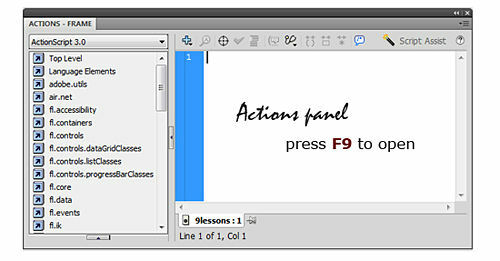 Now select the first key frame on the actions layer and press F9 to open up Action script panel. To check our scripts to run press Ctrl + Enter to run our application. If it is running with no errors, the last step is to publish an Air File. 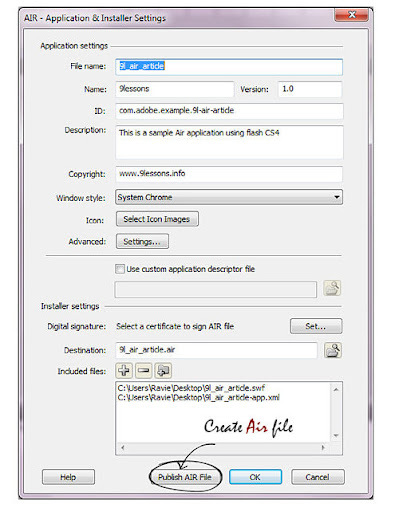 To publish air application Edit the AIR Setting and in the settings give all the details required. After filling all the data click on Publish AIR File. Now an air file created in the same directory. Wow Great article! Thanks a lot. are you panning to add more functions like a rss feed or show info taken from a db? waaw.. is it your first post about flash? Its really great tutz about adobe air .. so can we integrate PHP with adobe air? great post, got a good intro to adobe - AIR application devlpment. can u please put a post on php integration with adobe-AIR. I create a facebook app using adove air. But when the after the login on facebook, the login window doesnt close and just say "Success".